Here at H&M Self Storage, we know our success is due to our wonderful team. The care they give our customers is unparalleled and we want to highlight their milestones along the way. 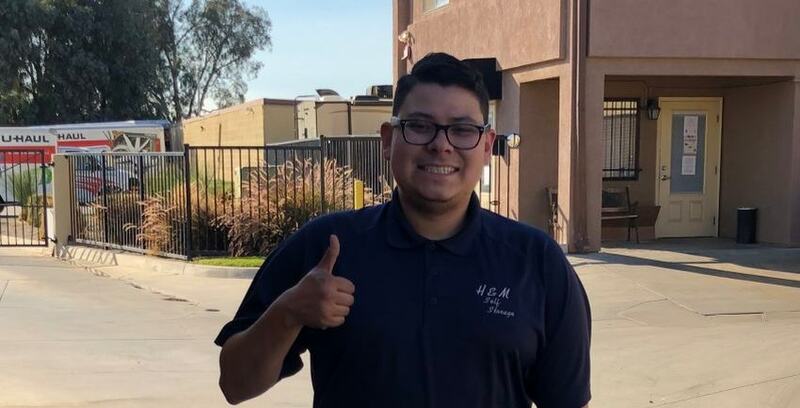 Below is an interview with Marc Romo, who is celebrating his 1-year anniversary with H&M Self Storage. Marc works at H&M Self Storage in Sun City, California. Shannon: Hi, Marc! Thanks for chatting with me about your work anniversary! It’s on October 30th, right? How many years are we celebrating? Marc: Yes, around there, I believe! This will be my first year. Shannon: Oh, I see! Congrats on a year! 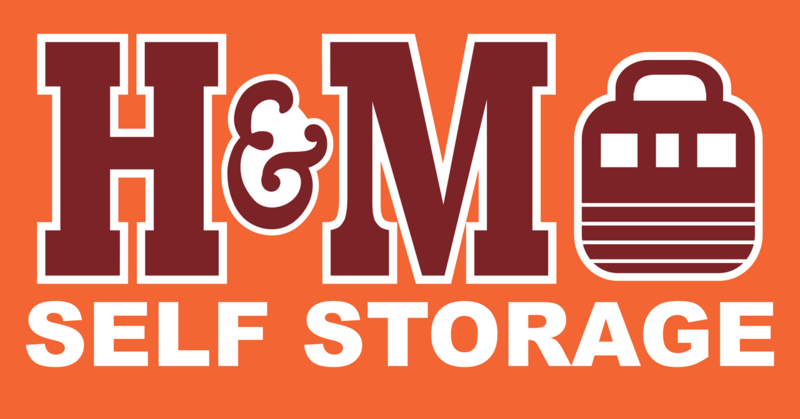 What were you doing before you worked with H&M Self Storage? Marc: Before self storage I was doing property management. Shannon: What kind of property management? Marc: It was residential. I worked for Coldwell Banker. I was a leasing agent for them. Shannon: Why did you decide to switch over to self storage? Marc: It was just an opportunity that was given to me, so I thought I would try it out because it sounded kind of fun. The way the recruiter presented it, they said it was pretty much like what I was already doing, but more fun. Turns out it is more fun, so now I am the Assistant Manager here! Shannon: That sounds awesome! What makes it more fun than where you were previously? Marc: Every day is different. You never know what’s going to happen, so it makes it fun and definitely not boring. Shannon: Was there anything about the self storage industry that surprised you? Marc: I didn’t expect it to be this exciting and fun. I really didn’t, but it really is similar to being a leasing agent. It even has the same clientele. You do get the occasional crazy situation, but that’s what I love because it makes the day interesting and go by faster. As far as customer service, everyone has a different story. You never know what to expect, so I always go into situations with a smile and hope everything goes alright! Usually, things turn out great! Shannon: I’m glad to hear that. Was there anything about the company specifically that surprised you? Marc: I don’t know if it’s just self storage, or the company we work for, but everyone here is like a family. I wasn’t expecting to come in and feel as welcomed as I did from day one. That was definitely a game-changer, something I really did not expect. “Marc is an amazing team member. He is always looking out for his team and making sure we all have the help that we need. He is dependable, responsible, and a hard worker. He is also known as the best cappuccino maker! He prepares some delicious espresso that makes you ask for doubles. Thank you, Marc, for all you do and the delicious cappuccinos!" Shannon: Speaking of friendly people, is there anyone you have worked with who was especially helpful getting you up to speed or just being there for you over the past year? Marc: Monique. She's always there and always has the right answer. If, by chance, she doesn't have one, she will get back to you right away as soon as she does. As far as other team members, everyone is pretty awesome. I've never had a situation where I called someone and it didn't get an answer or found someone who was unwilling to help me out. Shannon: Having reliable teammates makes all of the difference! Switching things up a bit, I want to know more about what you like to do outside of work. Do you have any hobbies? Marc: Hobbies? I mountain bike! I mainly do downhill mountain biking. I do that as often as I can, at least when the mountain isn't full of snow. I have friends I hang out with who work at other businesses that I help out with sometimes as well. Shannon: Sounds like you have a very active life! Do you have any favorite places in town that you like to go to? Marc: Well, I like craft beer and there's a brewery I heard about a few months ago that my friend showed me call the Mason Jar. It’s a craft beer brewery and it's just like working here. Shannon: That’s interesting. How so? Marc: Everyone welcomes you and is like a family. It's really small and kind of hidden, but extremely well known. I love it so much, because they specialize in everything from stouts to blondes, and all different kinds. It's always rotating.